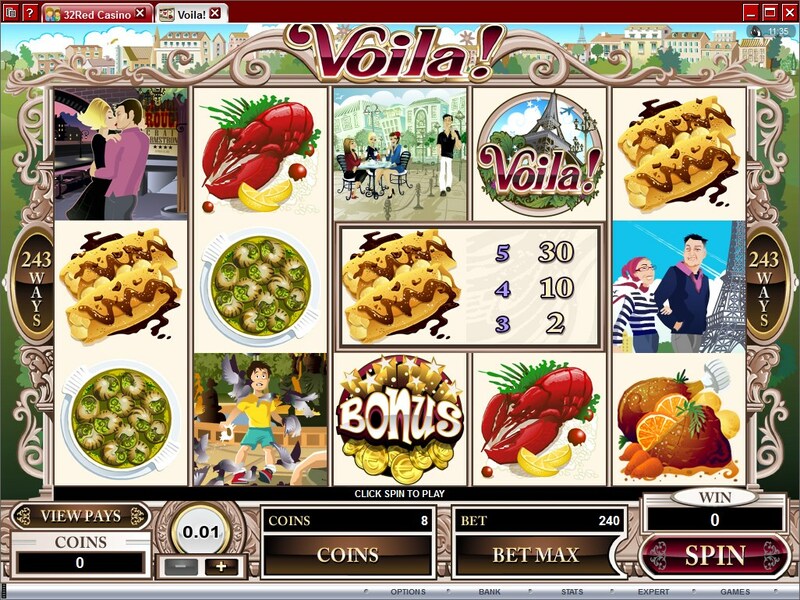 Voila is one of the French themed slot machines available these days, and while there aren’t a lot of them, enough exist to cover the huge fan base that the city of Paris and the French have. Beautifully decorated and with great foods, cafes and landmarks being among its symbols, it’s designed just like a French themed game should be like. It’s a Microgaming slot machine, and I think they did a wonderful job with it. 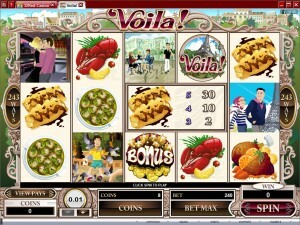 This travel themed game offers 5 reels & 243 paylines on them. 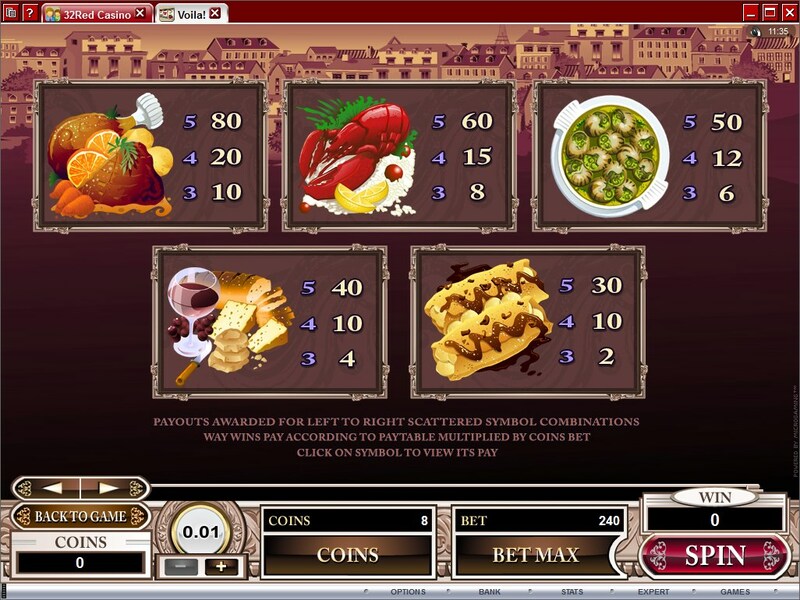 It also has scatter symbols, free spins, multipliers and wilds, all great options. The top payout reaches a value of $12,000. 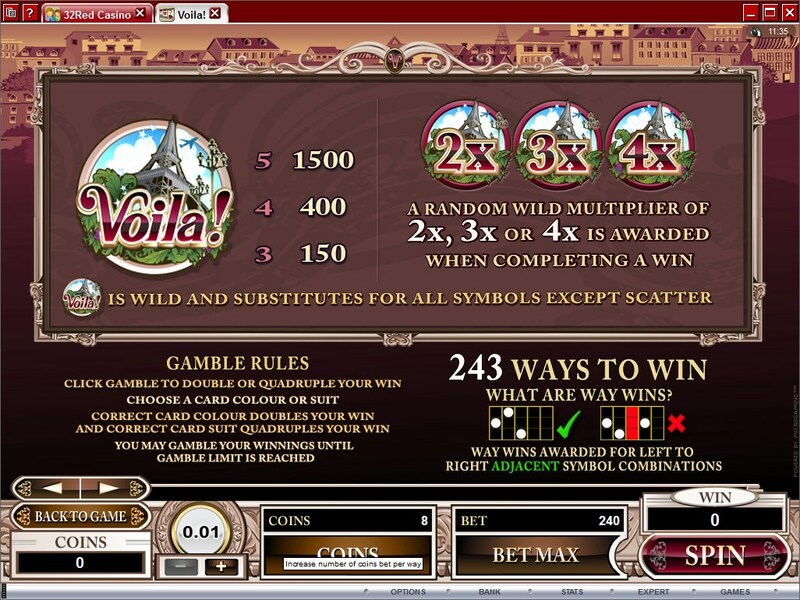 Among the features which Voila puts forward you will discover some very cool ones, like the scatter symbol which triggers free spins with multipliers, or the wild symbol which also applies its own multipliers. In case the features aren’t enough to convince you, perhaps the use of ways to win will do that for you. This system, which replaces regular paylines, pays less per win but offers prizes often enough to make up for it. The symbols which form these combinations need to appear on consecutive reels, going from the 1st towards the 5th. 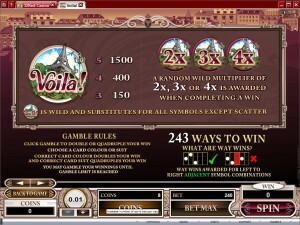 The Eiffel Tower is part of the Voila Logo and it’s the image you see when you get the wild on the reels. Since all the reels get the wild, you will sometimes see it create its own combinations, something which is easier than ever since the symbols need to be on the right reels. Payouts of up to 1,500x are going to be awarded in this case. The thing I enjoyed most about it is the random multiplier which is applied whenever a wild contributes to a win, the value being between 2x and 4x. As it often happens, you also have access to a scatter symbol, with a Bonus Logo on it and with gold Euro coins at the bottom. Appearing in scattered locations, on whatever reels they happen to show up, these scatter symbols give away prizes of 1x to 100x the bet and also trigger the free spins. 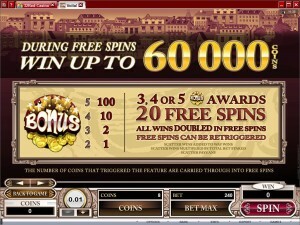 You will need scatter symbols in at least three locations on the reels in order to get into the free spins feature. The reward will consist in 20 free spins, which will have all their wins worth twice as much as the paytable indicates. Retriggering free spins is possible as well, the requirement being that you get another 3+ scattered Bonus Logos. You get to use coins of up to $0.20, while the minimum denomination is at $0.01. Up to 20 coins may be used on each active line, so you can expect a line wager of $4. 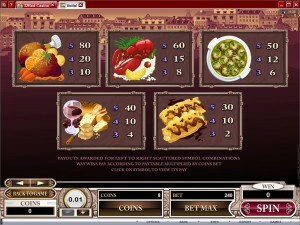 The slot’s maximum wager is at $120, while the minimum one is $0.30. The scatter symbol gives you back up to 100 times what you wagered, so a top payout of $12,000 is possible thanks to it. The wild symbol pays 1,500x the line bet, so up to $6,000. The design is one of the best things about this slot machine, and I recommend the game based on that alone, even though the features are pretty good also. You will find lots of wonderful Parisian views and foods, including things like plates of snails, crepes or lobsters. The people are another important part of the design, usually in couples and walking on the streets of Paris. The beautiful city of Paris is visible behind the reels, but it looks like a view of the suburbs, since there is a lot of green as well in the image. 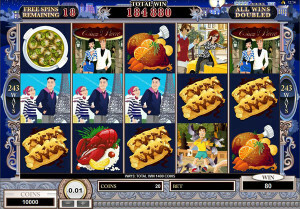 Symbols: Bonus Logo (100x the bet, scatter), Eiffel Tower (1,500x, wild), Couple & Eiffel Tower (250x), Lovers (200x), Couple & Car (175x), Couple at restaurant (150x), Waitress (125x), Parisian Café (100x), Duck L’Orange (80x), Lobster (60x), Plate of Snails (50x), Cheese with wine (40x) and Crepes (30x). 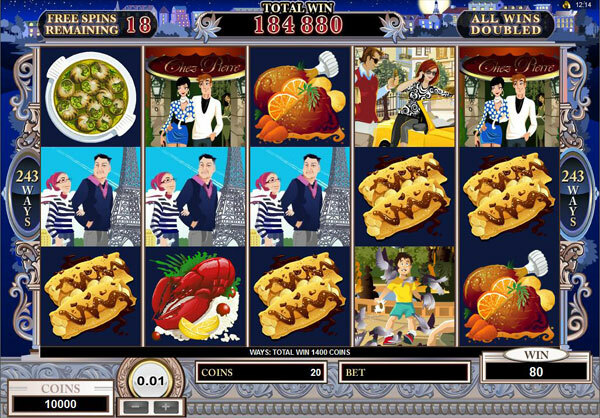 For the fan of French cuisine or of the beautiful architecture and lifestyle which comes with Paris, it’s the perfect slot machine to play. You will find Voila! at any online casino which chooses to use software from Microgaming, playable either for free or for real money.